If you’re not familiar with the ongoing Animate series of videos from the RSA, they are well worth a look. Whilst these short animations, based on excerpts from RSA lectures, may be fairly rudimentary, the visual annotation provides an innovative way of disseminating key concepts and ideas. I particularly recommend watching Sir Ken Robinson’s on changing paradigms if you have even the slightest interest in education. Hew and Hara (2007) present reciprocity as one of six motivators to sharing knowledge in online environments. Reciprocity can be direct – between a provider and a receiver – or generalised, indirectly by a third party (Ekeh, 1974). Whilst personal gain refers to increasing one’s own welfare (such as recognition, reputation and self-esteem), altruism increases the welfare of another person. Hoffman (1981) views group commitment or ‘collectivism’ as a variant of reciprocal altruism, in which the individual member increases the welfare of the community by identifying with and valuing a collective vision or purpose. Pinker’s ideas introduce a fresh perspective to these types of discourses into the understanding of online knowledge exchange and community development, and raise a number of interesting questions. How are our participation, mutuality and reciprocity characterised by the (increasingly multimodal) forms of language apparent in our social interactions on the web? And are these defined by inherent technological cultures (‘nettiquette’ etc.) or by dominant social factors, power relations and hierarchies external to the web environment? Ekeh, P. P. (1974). Social exchange theory: The two traditions. Cambridge, MA: Harvard University Press. Hew, K. F., & Hara, N. (2007). Knowledge Sharing In Online Environments: A Qualitative Case Study. Journal of the American Society for Information Science and Technology, 58(14), 2310-2324. Hoffman, M. L. (1981). Is altruism part of human nature? Journal of Personality and Social Psychology, 40(1), 121-137. 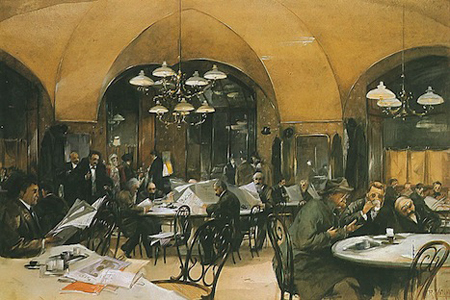 This weekend I’ve enjoyed reading about Young Vienna, a group of Fin-de-Siecle writers who frequented Café Griensteidl and other coffeehouses in the Austro-Hungarian capital at the turn of the 20th century. The group included Stefan Zweig and Arthur Schnitzler, whose stream-of-consciousness writing prefigured Proust, Joyce and Woolf. According to Watson (2000), its coming together represented a pivotal moment in intellectual thought, at a time when the rigid sense of order defined by Newtonian physics was being challenged by the discovery of particles and quanta, and which coincided with increasingly Modernist influences in art and music, epitomised by Schoenberg’s experimentation with dissonance and atonality. In between the plenary sessions, the workshops and the keynote address from Aleks Krotoski, the programme provided several opportunities for discussion. I found myself in a lovely group of fellow academics who shared a healthy mix of enthusiasm and criticality in understanding their own social media practices. The organisers were particularly keen to encourage Twitter networking and amplification and collaborative meaning making through Google Docs. But for me, it was a useful reminder that sometimes the best conversations happen when we put down our mobile devices and close our laptops. This post is an early contribution to an exploratory exercise in collaborative writing following recent discussions with fellow Twitter users @jennifermjones, @martin_eve and @FlyGirlTwo. In discussing the activities associated with the recently established Twitter hashtag #phdchat and its emergent postgraduate student following, we hope to use our own online spaces to create an open dialogue for critical reflection that others (not least ‘phdchat-ters’ themselves) can contribute to and develop. #phdchat is a themed, hour-long session held every Wednesday at 7.30pm UK time, with associated asynchronous chat through the rest of the week, and – at present – limited activity on other platforms (a wiki and a Facebook Group). For a more detailed overview, and an account of its brief history, see Martin’s excellent introductory post. Many of the increasing number of studies into Twitter have adopted modes of enquiry based on largely quantitative and data mining methods, which provide very useful indicators of participation activity, frequency and interactions, often utilising easily accessible visual forms of dissemination. Microblogs like Twitter present researchers with explicit environments that lend themselves – perhaps too easily – to a network-based research paradigm that can reduce user relationships and interaction to nodes and clusters without adequately addressing the complexities that underpin such activities. By critiquing such methodologies we can also problematize the over-emphasis on digital artefacts as a singular indicator of social media use. Whilst I realise active participation is fundamental to the web 2.0 rhetoric, we should recognise that the production and re-appropriation of digital artefacts do not necessarily represent the full picture of social media engagement and interaction. For example, I contributed to a recent weekly chat in between cooking tagliatelle and watching football on TV. Several studies have attempted to develop more qualitative models for analysing tweets, including boyd, Golder et al.’s (2010) look into retweeting practices, whilst others (for example, Priem & Costello, 2010) adopt a mixed methods approach, supporting quantitative data with participant interviews. I’m sure there are other examples in the growing body of literature. Type – e.g. open, reply, retweet. direct message etc. Orientation – e.g. crowdsourcing, notification, backchannel etc. Feature – e.g. (includes) RT, link, hashtag etc. I’m not suggesting that even modified versions of these imperfect models would be appropriate for examining #phdchat, but it is useful to consider how such approaches might contribute to an understanding of emergent practices. Discernible themes in #phdchat are naturally influenced by the pre-determined topics of each of the weekly chats, though it is not uncommon for participants to go ‘off-piste’ in their discussions. Whilst recurring themes related to ‘doing a PhD’ are clearly evident – such as specific academic practices (literature review, writing up etc. ), theories and methodologies, and use of technologies – we also need to recognise that many of the tweets indicate phatic, empathic and socio-affective forms of conversation. It may well be these elements of peer support that represent the real value of this growing community. The proposed paper describes current doctoral research into how a small sample of social sciences, humanities and interdisciplinary PhD students are adopting and using social and participative media (web 2.0) in their academic practices. The study uses a qualitative, mixed-method design of observation of online activities, participant-reported accounts and successive in-depth interviews. An Activity Theory-based analytical framework of interrelated activity systems is used to describe shifting patterns of practice across multifarious academic contexts and through key phases in the doctoral experience. The study adopts holistic perspectives of (i) doctoral practices, that legitimises academic activities beyond those related purely to thesis-development and established models of participation and enculturation, and (ii) of social media, responding to the multiplicity, interrelatedness and transiency of web 2.0 tools and platforms. In doing so, it recognises the self-efficacy and heterogeneity of PhD study in the negotiation of multiple socio-technical research communities and networks, and the complex role social media can play in identity-formation and induction into doctoral scholarship and academic professional development. In addressing the significant gap between the potential of web 2.0 and the reality of low adoption rates and lack of widespread use, the paper proposes that dominant discourses and idealised concepts within the educational technology and media communities do not necessarily reflect the majority of doctoral students’ engagement with social media. Rather, key incentives, disincentives and barriers created by tensions with embedded research cultures within and without the faculty, and inconsistencies in training opportunities and shared practice, heavily influence and disrupt patterns of adoption and use. The paper will also describe how the dissemination of the activity systems analysis is facilitating the ongoing participant interviews, enabling a negotiated understanding of participants’ use of web 2.0, and encouraging a shared, critical and reflective dialogue for the development of effective social media practices.